Elegant! First thing that came to my mind as soon as I saw the car in flesh. It’s the low and long front hood that has this menacing look, almost grinning straight at you with its low prowl. The hood looks strong and imposing with its lines and complementing it are the LED headlamps that look evil in their own way. The grille is designed to look sharp in its Titan black colour with horizontally-placed chrome inlays and the Audi logo at the centre of the headlamps. The car doesn’t come with fog lamps, not that it needs them but instead comes with some chrome trim and very aerodynamically purposeful looking vents for cooling the brakes. Moving to the side of the car, there is a side vent with a short chrome inlay and a strong shoulder line running all the way from the headlamp to the tail-light. The door handles open upwards instead of the usual outwards making it a lot easier to open. The frameless doors are beautiful and just give this car a very unique look and surrounding them is you guessed it, more chrome. Although I have to admit, the use of chrome is minimal and doesn’t put me off one bit. The car also gets 17-inch twin 5-spoke wheels that look good. Coming to the rear of the car, it has a really sleek coupe-like roofline that’s so attractive with it curving slightly off the edge of the boot. The tail-lights are simple yet sharp LED units with dynamic indicators that are smoked, which add to that extra appeal. The car also gets chrome-finished twin exhaust pipes. On the outside, the S5 has the same shape and dimensions as the A5, but gets an S5 logo and a more aggressive looking front, with an optional titanium black grill with horizontally slatted matte aluminium inlays. The side mirrors are finished in brushed aluminium with the indicators integrated into them. The car even gets more aggressive S-Line side skirts finished in black. The S5 too gets 5-spoke 18-inch wheels which are a lot sharper in design compared to the A5 and look so much better too, with the brake callipers finished in red and the S5 logo on them. It has a much sportier rear diffuser in matte aluminium silver housing the quad chrome-plated exhaust system. The S5 is definitely the most attractive car in its segment. The small joy of a frameless window sliding out of its slot each time you pull at the door handle is one of those small but special things about owning a coupé or Sportback. Less so is the fact that this car is largely restricted to being a four seater; you could get a fifth person in there, but he’d be very cramped. Still, headroom in the back is not as bad as you’d think for a car with a sloping roof, partly because it’s scooped out at just the right place, and partly because the roof extends further back than in a conventional coupé. Legroom is more than sufficient though, and the other advantage of this being a Sportback with a Skoda-Octavia-like liftback tailgate, is that the boot is massive enough to hold weekend luggage for four with ease. At the front, since the S5 is based on the A4, you get the same dashboard that car, albeit with some sporty flourishes like carbon fibre on the centre console. However, it is starting to show its age now – the A4 is now the oldest model in Audi’s range (save for the soon-to-be-replaced Q7), and though the quality as always is top drawer, the design doesn’t feel as sharp as in newer Audis. It’s a similar story with the equipment – the MMI system has all the functionality you want, including satellite navigation, but the interface isn’t as slick as the latest version, and that applies to the trip computer screen between the dials. The optional sports seats on this car, upholstered here in a tasteful brown and black, are really good even for long distances though, and the flat-bottomed steering wheel feels great to hold. 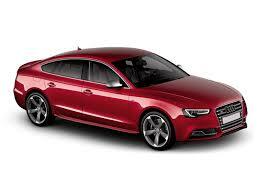 The new Audi S5 Sportback runs the familiar 3.0-litre turbo-ed V6 petrol engine from the previous S5. However, it now makes more power 356PS/500Nm, up from the 333PS/440Nm of the outgoing car. The performance is just electric and right from the word go, there is so much of available torque. This is what I love in a sportscar – accessible performance while still looking a million bucks. Audi claims she can punch 100kmph in just 4.7s. The top speed is 250kmph. Dial in the Dynamic or Individual mode and the Audi S5 Sportback ditches her heels and heads straight for the horizon. The pull is apparent right till the 5,500rpm range. Use the paddle shifters and the car goes into a whole new zone – shifting at her 6,500rpm redline. Fast, she is stealthily fast. A boost pressure gauge shows how much more torque is in reserve. At it, the Audi S5 Sportback also sounds wicked (you should check our Facebook video). In the Dynamic mode, the quad exhausts sing in symphony with high pitched notes with equal measures of pops and crackles thrown in! What I didn’t like was that while in Dynamic mode, if you let go of the throttle and get a bit lazy, the gearbox upshifts even at low rpms, similar to when you opt for Economy mode. One quick jab at the accelerator and the qualities of the Dynamic mode are back. Unfortunately, the India-spec cars don’t get adaptive damping and so there is no difference in the way the suspension behaves over roads when the driving modes change. When it comes to driving, however, the two cars are as different as a warm, soothing mocha and a charged-up double espresso. Both the A5 and the S5 have the same hero ingredient. But, while the former with its quiet and refined diesel is all about ease of driving and wafting in luxury, the S5 with its V6 turbocharged petrol is a wake-up call.With the driving mode set to Dynamic and the gearbox in S mode, the S5 cannot help but go charging into the horizon. The throttle response is crisp and alert. The engine is in a tearing hurry to hit the redline and it makes all the right noises too. All of this makes it very difficult to keep one’s foot off the gas pedal. The drive can get a little jerky in this setting, especially if you aren’t paying too much attention to your right foot. But, the overall outcome is well worth it. Various effective safety measures have been incorporated in the S5. The basics are Anti-lock Braking System (ABS) with assistance from Electronic Stabilisation Control (ESC). Then there are multiple airbags. Head airbags with side airbags with security measures include the reverse parking camera and parking sensors (front + rear), crash sensor, brake assist, engine immobilizer impact beams, etc.Being a S, it has good acceleration and an equally good braking system too. The S5’s brakes have a progressive bit and this makes it easy to brake and even the pedal feel id good enough. The parking brake is electronic like all the other Audis. The S5 is a likeable car for someone wanting more than just a luxury sedan, especially with the sportback design and brilliant V6 petrol motor. It feels sporty outside and luxurious inside, even if familiar looking. Add to that brilliant handling manners and well-appointed interiors and you have a car that’s truly irresistible. That’s of course if you don’t mind the fuel bills that is – claimed efficiency is an impressive 12.2kmpl but expect it to drop down deep into single digits should you choose to put the 333 ponies to task. The sportback styling also means rear headroom isn’t great, so it isn’t a car you’d want to be chauffeur-driven in, rather one you would love to drive yourself. And at Rs 62.95 lakh ex-showroom Mumbai it is not too expensive either, when you think of it as a fast luxury sedan cloaked in sportier clothes, and one that has a soul too.